Library users in Campbelltown will be able to quickly and easily check their books out when the HJ Daley Library introduces new self-service kiosks to cut queuing. The easy-to-use units, which scan your library card and book bar codes, are just part of a larger refurbishment that will create more space to relax and work in, and give the library a contemporary look. “The new design for the library will be more open and welcoming with extra lounge areas for people to work and read,” says Campbelltown Mayor George Brticevic. “The introduction of self-service kiosks will bring HJ Daley in-line with our other branches, which already use the technology and give library users the experience they deserve with more space and staff freed up to deal with other enquiries,” he said. 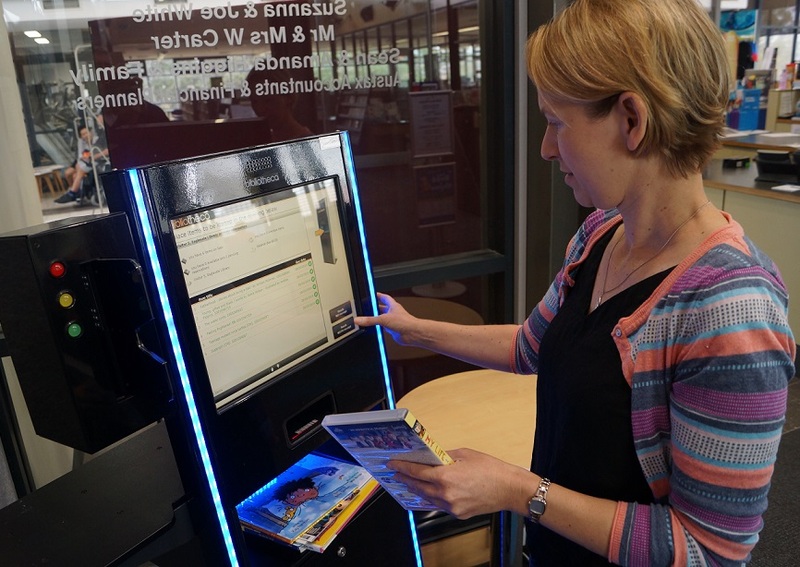 A library assistant at Eagle Vale Library demonstrates how the self-serve kiosks work. The refurbishment of the city’s main library branch in Hurley Street is being made possible by a Stronger Communities grant from Dr Michael Freelander, the federal member for Macarthur. The large front desk, currently in place near the entrance to the library, will be replaced with an open design that includes comfortable new lounges and small tables for setting up laptops and devices. Work will be carried out from this Thursday, March 21 and until April 10. The library will close from 5pm this Thursday and all day on Friday, March 22 to allow for the refurbishment area to be closed off to the public. The noisiest building work has been scheduled to take place before 9.30am to minimise disturbance to library users, and the area being refurbished will be closed off from public access with entry via the meeting room doors. Library services and programs will continue as scheduled.